There is another kind of arachnid, more closely related to spiders, which has what looks like exactly the same kind of pincers. For this reason they are known as psuedoscorpions. They're tiny, just 2 to 8 millimetres long, but are no less effective a predator for that. Venom in their pincers allow them to immobilise and kill their tiny prey, such as flies, ants and mites. They also eat booklice and the larvae of carpet beetles and clothes moths. Who would've thought that such a tiny little thing could do so much good? For the back-end, why not take a look at the scorpionfly. They look quite extraordinary, nasty really; you can imagine them inspiring the design of many an alien in the movies. 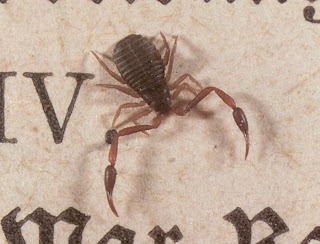 They're clearly named after their tail, which looks a lot like that of a scorpion. In fact, only males have this feature, it's actually they're gentalia (stop staring). 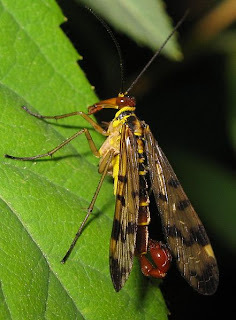 So while the scorporion uses its tail to sting and kill, the scorpionfly uses its own for procreation. Not only that, but while some scorpionflies eat vegetation, others eat living or dead insects, even stealing them from spider webs. Some of them have lost their wings, have compressed bodies and look quite a lot like fleas. You could even see fleas as a highly adapted scorpionfly. So it uses its tail in the opposite way to the scorpion, it steals from spiders and while psuedoscorpions battle away eating some of our most annoying pests, the scorpionfly has busied itself turning into fleas. All in all, it kinda looks like the scorpionfly is a natural enemy of all arachnids. Which is a shame, they have so much in common. Interesting blog, can't say I am a bug person myself but like your layout if not the pictures I guess you have to like the subject. Good luck with your blog and thank you for connecting with me. Thanks for taking a look, I hope you succeed in your own madcap scheme and I'll definately pop round to see how you're coming along. I might even call you 'Milly' for short. Very interesting site.Scorpions are such dangerous yet beautiful creatures. Thanks! And yes, scorpions definately have a certain something, elegance maybe, or poise. It's like they're ready to waltz.